This is a round Columbia Records porcelain sign. This particular Columbia Records sign is colored and shaped like a vinyl record. 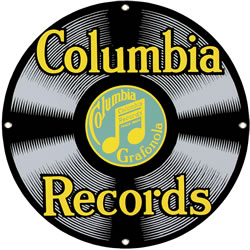 It reads, “Columbia Records, Columbia Grafonola” in yellow text.